X. Description of certain Pits in Derbyshire by Hayman Rooke –These pits go by the name of Pitheads, and are in a wood called Linda Spring, lying at Linda-lane, about a mile from Brackenfield near Crich. They are in two straight lines, forming a street 250 yards long; in width at the western end four yards, in the middle five yards, at the east end nine yards. there are 28 pits in the southern row, and 25 in the northern; one with another 16 feet by 15, and 6 feet deep. This street of pits, the writer, not without a great show of probability, supposes to have been a British town, which, allowing three only to a pit, would contain 159 persons. Pit-steads: In a wood called Linda spring, near Crich, are two rows of round pits, called Pit-steads, one of them containing twenty-five and the other twenty-eight ; and extending about two hundred and fifty yards in length: most of them being about fifteen feet in diameter and six feet deep. A particular account of them is printed in the Archeologia, Vol. X. page 114. communicated by Hayman Rooke, esq. who conjectured that it might have been a British town; there being no ore, coal, stone or clay, to be found here. Early men avoided both marshy valleys and too-exposed high places and one of the earliest traces of men in the parish is in Lindway-Spring Wood  to the north-east of Crich Hill at a height above sea-level of between 500 and 600 feet. Here are to be found the remains of stone-lined pits in which Stone Age men of 4000-2000 B.C. made their homes. There are two rows of pits of circular form - called the Pitsteads. One row contained twenty-five, the other twenty-eight, extending two hundred and fifty yards in length: most of them were about fifteen feet in diameter and six feet in depth. Reproduced from 1899 Derbyshire Sheet XXXV.5 Second Edition Ordnance Survey map with the kind permission of Ordnance Survey. 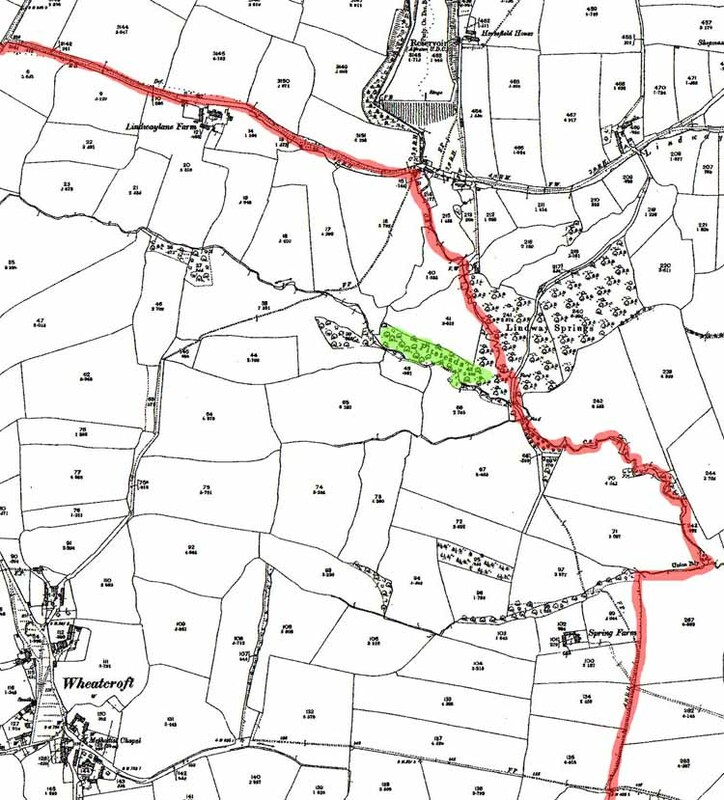 The Red line is Crich Parish boundary. Leaving Stretton Station about 12:30 pm they walked through the beautiful grounds of Ogston Hall by kind permission of the owner and were later joined by him and others of the household. Stopping on the way for lunch, a paper was read by Mr Edward Watkins, of Fritchley, explaining that these relics were pre-Roman and probably represented a style of housing dating back from Roman times to 2000 BC. What is now to be seen is about 53 circular pits averaging roughly 12 to 14 feet in diameter and 5 or 6 feet deep. These are the excavation bases of huts which were roofed over by poles converging to a centre covered with interlaced boughs of rushes and clay, the earliest form of “wattle and daub”. The object of these sunk bases was conjectured by the writer of the paper to be to obtain more shelter from the wind and weather than the part above the ground could afford, a statement remarkably corroborated by the President (Mr TG Burr, of Chesterfield) as being the plan adopted by the soldiers in the Crimean War to improve their tents. The party were also shown a more perfect example in a wood near by discovered by Mr Watkins in his researches many years ago. This was about 12 ft in diameter and had an opening nearly 3 ft wide on the south side apparently the entrance way. Probably these hut dwellers wore scarcely any clothes. The oldest contemporaneous representation of ancient Britishers is a Roman sculpture now in a Glasgow museum of three captive Scots without clothes. Down to about 1670 the huts of the peasantry were probably no greater improvement on these – merely wooden frames covered with wattle and daub. The well-built stone farmhouses or granges scattered over mid and north Derbyshire at intervals of 2 or 3 miles represent a revolution in the habits and housing of the country. They are often called Elizabethan. That may be their style but most seem to date from 1670 to 1690, seldom earlier. One in Wheatcroft, close by, appears to be 1651. We may not owe much to these poor hut dwellers in art, literature, or science, but we are indebted to them for our greatest natural inheritance – a sound and sturdy physical construction, the basis of all efficiency of England's greatness and renown. The chief characteristic of their life perhaps was its outdoor nature. To that we must return if we will keep this great inheritance. And when we consider that 1500 millions or nearly the whole population of the world could reside in these islands and still have over 4000 square miles or more than four counties the size of Derbyshire, without inhabitants we see there is no excuse for overcrowding anywhere. The natural remedy for most of our ills lies largely in more outdoor life and working in fewer hours in the factory, the shop, the office or the mine. In more land culture to lies the solution of most of our problems, agriculture being the only trade which is self-supporting and boundless in scope, the panacea for unemployment, pauperism and undo competition in other occupations.